Battery Life Extensions. Traditionally, Apple products have long product cycles and are only upgraded conservatively here and there. 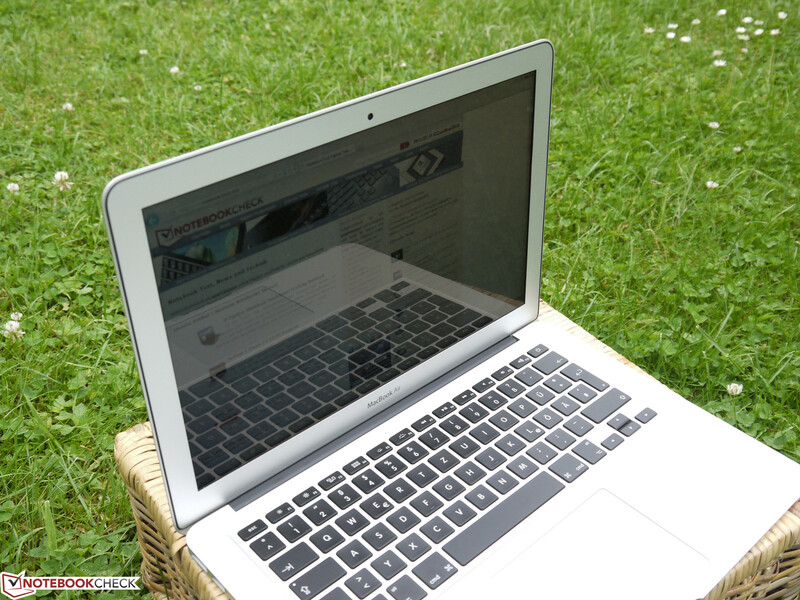 Thus, it does not come as a surprise that the MacBook Air 13 is the spitting image of its predecessor. In the following review, we will take a close look at what has changed on the inside. 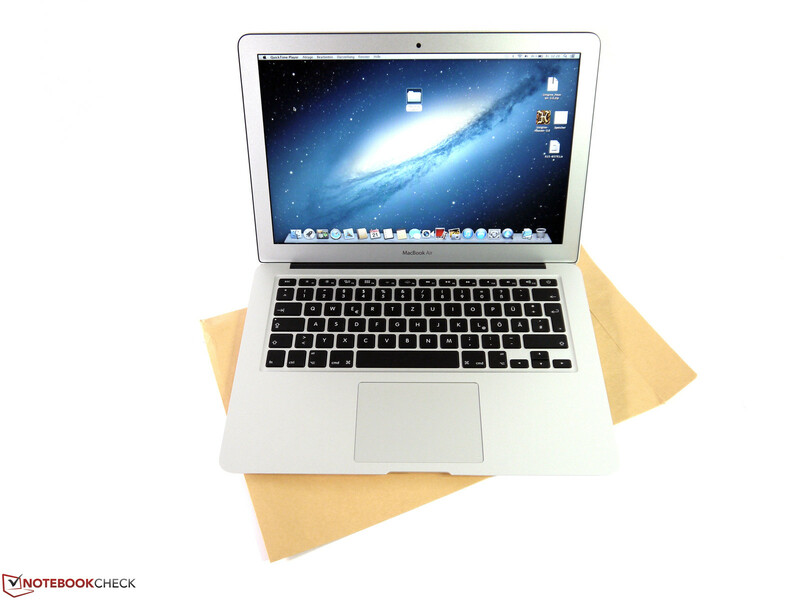 Since the launch of the MacBook Air 2008, the only major case update Apple has performed was in 2010. 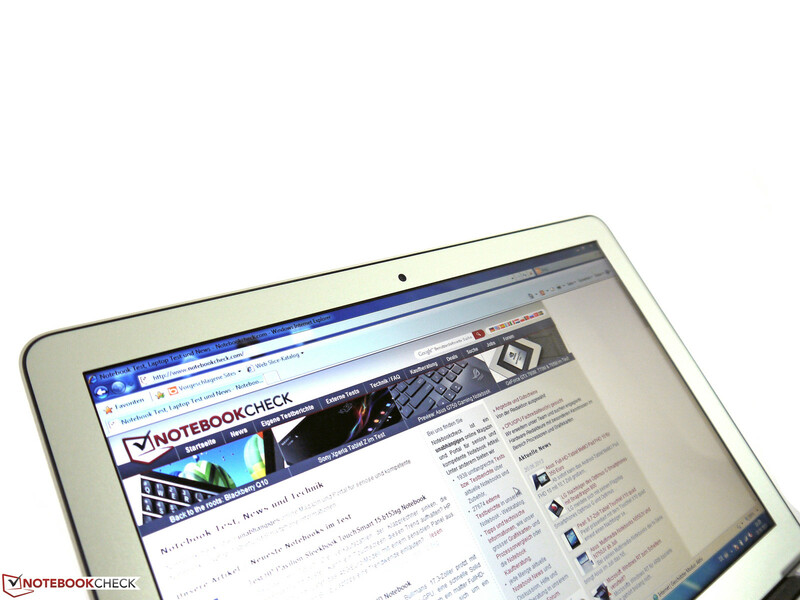 Their unibody case design has been the industry standard for slim, yet sturdy and powerful notebooks for years. Today, Apple is no longer alone in this segment; the MacBook Air has to fight tooth and nail for a position against competitors like the Asus Zenbook series or the Samsung Series 9. Still, Apple is confident of the outer appearance of their product, as the newest installment of the slim notebook is virtually identical (outside) to its predecessor. On the inside, a breath of fresh air blows: both the CPU and GPU have received updates, thanks to the new Intel Haswell generation. In addition, this slow evolution encompasses such changes as extensive WLAN standard support, faster Flash storage and increased battery life. However, if you were waiting for a better display (Retina), additional connectivity (4G) or a new design, you will have to keep waiting. 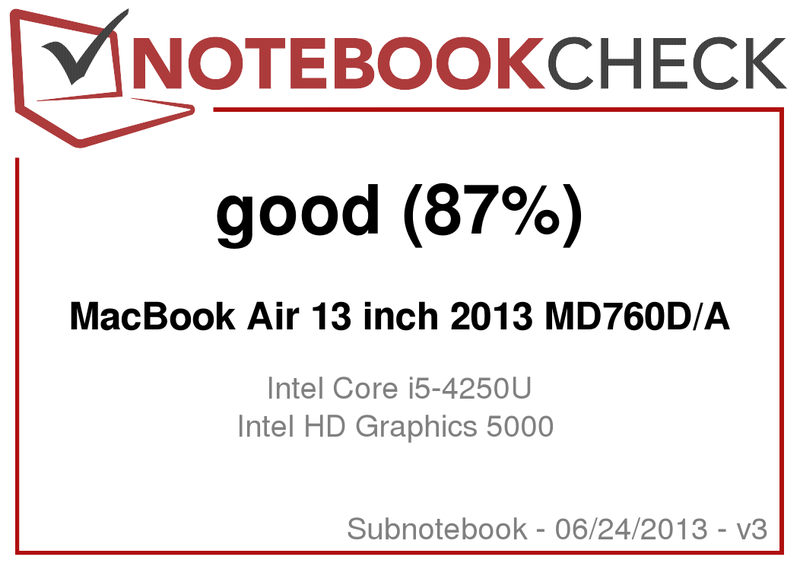 Our test was run on the 13-inch MacBook Air. 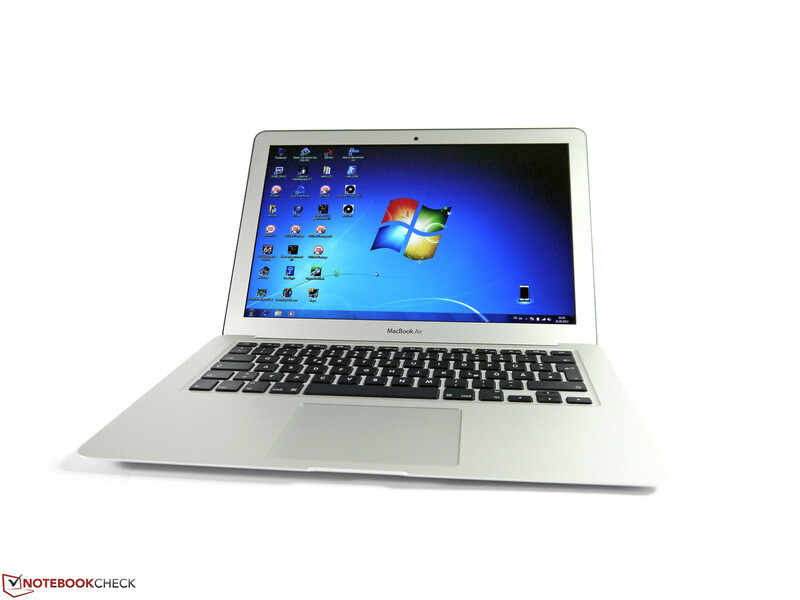 The test model (basic configuration) includes an Intel Core i5 CPU, a 128 GB Solid State Drive and 4 GB RAM. The reader can thus distinguish it from other built-to-order options on the Apple homepage. The Apple store lists our laptop at 1,099 Euros (~$1440) (delivery is free). The Apple unibody design has been extremely attractive since day 1 of its release in 2008. At the time, such a slim yet sturdy notebook seemed inconceivable and as such, the Apple design was the standard for subnotebooks for a long time. With time, the market has become saturated with laptops which offer similar build quality and today, the Apple subnotebook has to fight hard to find a place among models like: Asus Zenbook Prime UX21A & UX31A, Samsung Series 9 900X3C, Dell XPS 13 or Lenovo ThinkPad X1 Carbon. 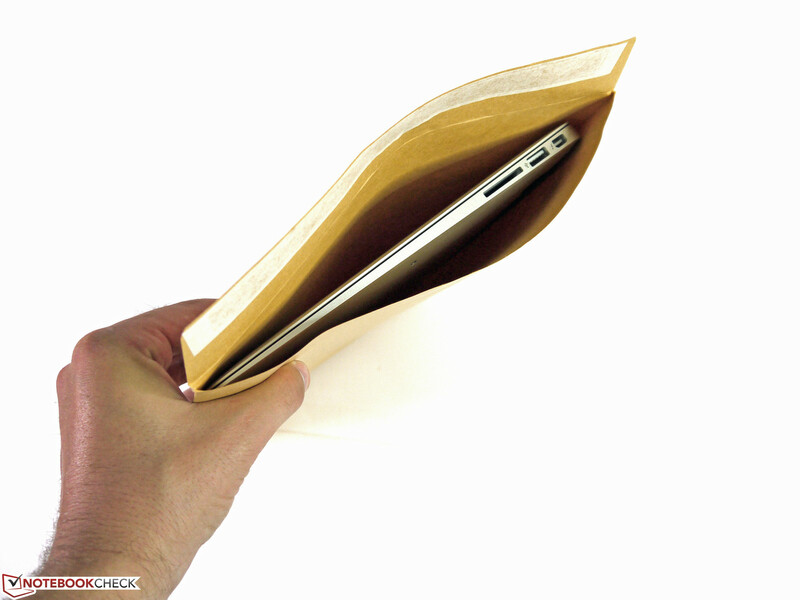 The 1.35 kg (~3 pounds) MacBook Air 13 fits easily in a B4 envelope. 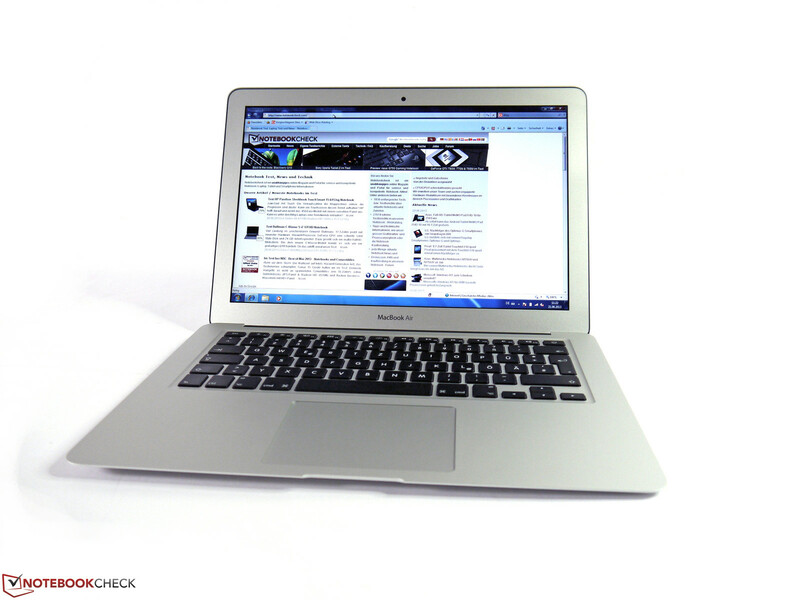 On top of this, it looks great and has a comfortable aluminum surface, while still offering great sturdiness. The base of the model is not easy to bend inwards and its four rubber feet hold it securely on any flat surface. The display cover can be bent inwards slightly, but it is not possible to distort the picture by pressing down on the edges or the middle of the cover. We did not like the display hinges of our test model. 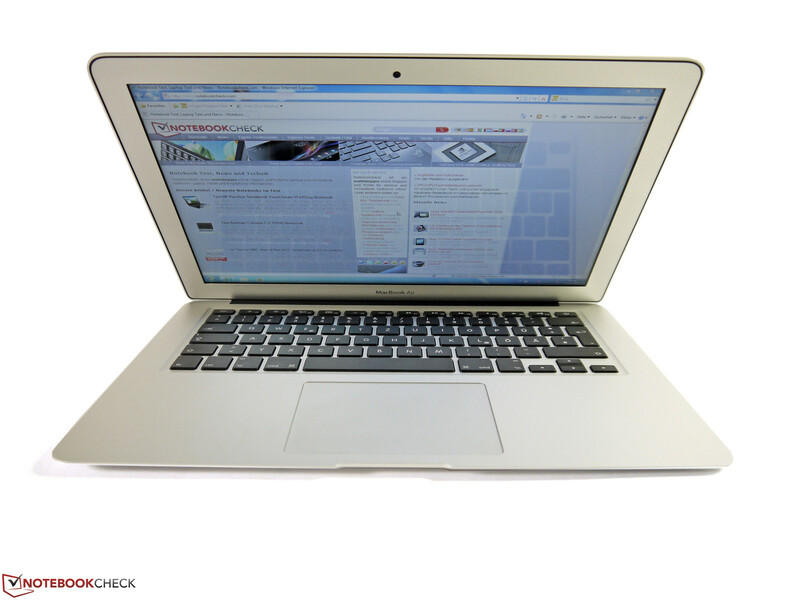 The further the screen is pushed back, the more likely it is to wobble, which leads to unintentional wobbling while moving the laptop. As the hinges cannot restrict this movement, the user will often be annoyed by distracting reflections (glossy display). The sharp hand-rest edge is a flaw as the user will often put his/her hands down in this area, and over time, the edge could start to hurt. 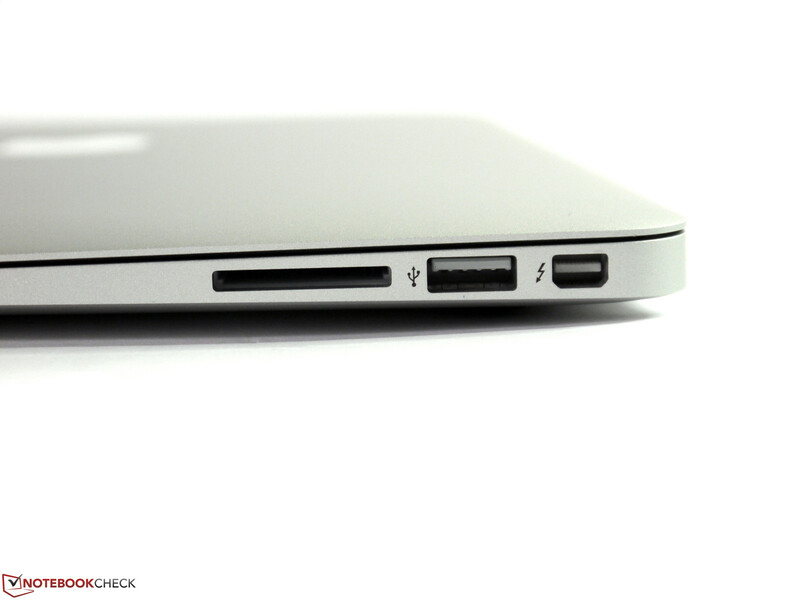 Magsafe 2, power outlet, 2x USB 3.0, Thunderbolt (compatible with DisplayPort) and a card reader are the ports to be found on the sides of the MacBook (near the rear). It may not be extensive but it does offer a solid base. 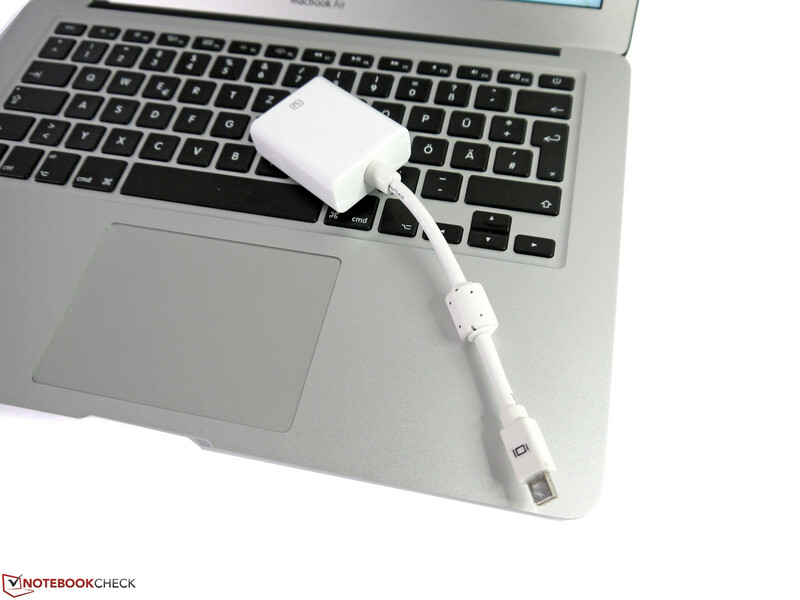 Adapters will allow the user to add on more ports via the Thunderbolt interface. Problems may arise from the placement of the ports, as the gap between them is not very large. It suffices for a normal cable, but large USB sticks or DVB-T receivers will block the neighboring ports while in use. 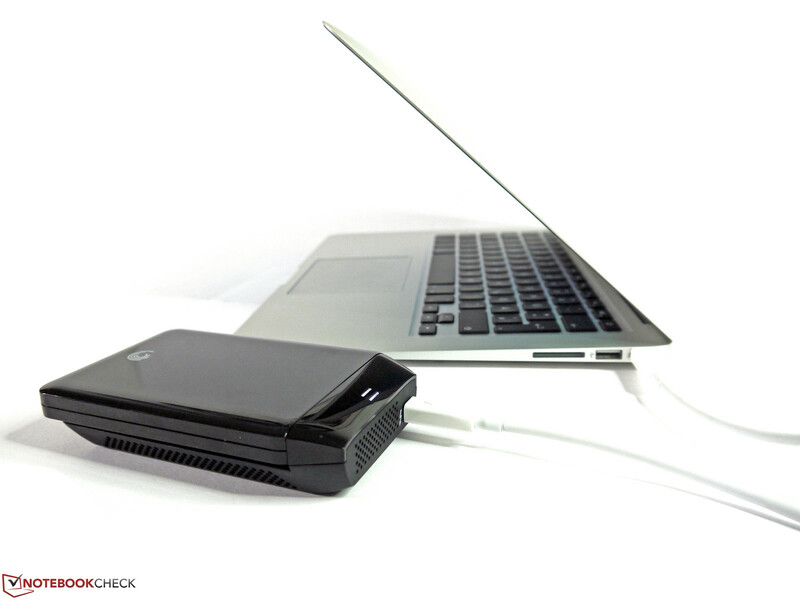 With an external Solid State Drive, we recorded transfer rates of 145 MB/s and 270 MB/s (with Thunderbolt - read). Both values were measured using Mac OS X. A mini DisplayPort or LAN adapter is not to be found in the delivery. Apple advertises the new WLAN standard 802.11ac with a 3x higher speed (in comparison to the 802.11n standard) and promises data transfer rates up to 1.3 Gbit/s. The new AirPort Time Capsule (WLAN base with network storage) and the new AirPort Extreme base operate with three streams; Apple has not specifically mentioned how many the MacBook Air will use. Still, the user can expect an increase in the WLAN speeds. An 802.11ac network was not available for our test, but in our test of the 802.11n network, we did not find any disconnections or significant speed fluctuations. Users who wished for a UMTS-/ LTE modem will be disappointed, as this continues to be an option only for iPads and iPhones. 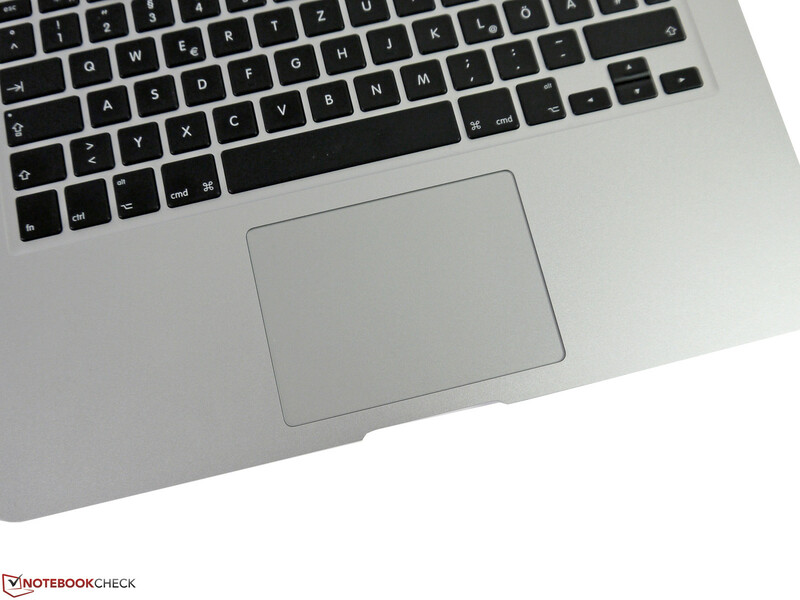 The typical maintenance flaps, as can be found on other models, are not to be found on the MacBook Air. The battery is non-removable and should only be serviced by an official service partner. Curious adventurers will need a pentalobe screwdriver to gain access to the innards of the MacBook. However, this could lead to the warranty being voided. Apple offers a relatively short warranty period of 1 year. An extension up to 3 years is only possible with the Apple Care Protection Plan (an additional 250 Euros/~$328). 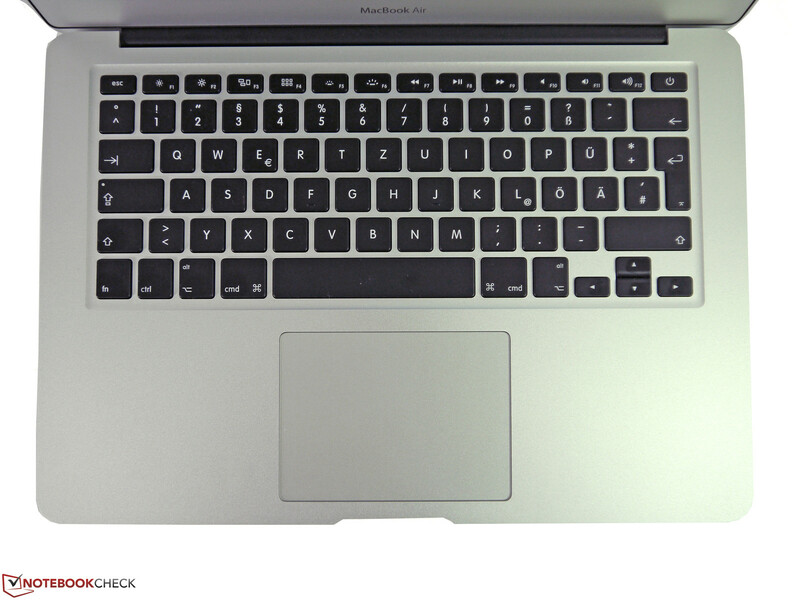 Keyboard and touchpad are of very high quality. Typists will be very happy with the clear pressure point, the low noise and the sturdy keyboard base. 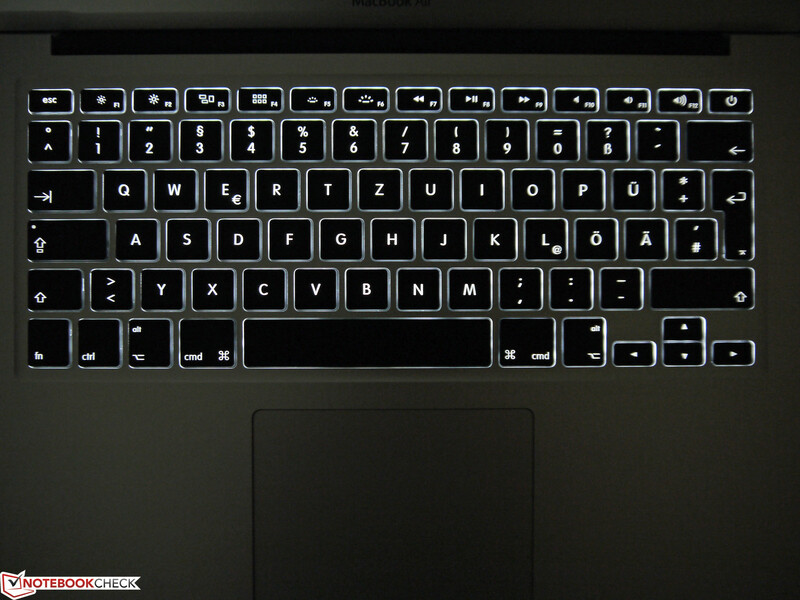 The keyboard backlight has many levels and ensures good legibility. The Enter key is a little small and the vertical cursor keys are too close for comfort. 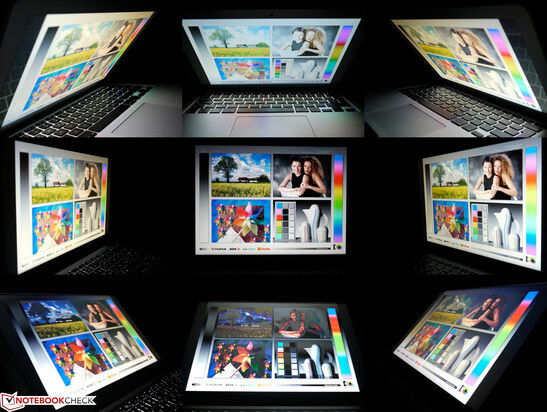 The touchpad measures 115 x 75 mm (~4.5 x 3.0 inches) and offers a lot of space for multi-finger gestures. The slide properties are great and the surface recognizes clicks well. Windows users will require some time to get used to the keyboard, as the layout is quite different. The Windows key, Print, Page Up/Down and a few other keys are nowhere to be found on the Apple keyboard. Configuring individual keys may alleviate some issues, but for best results, the user will have to get used to the changes. The new 13-inch MacBook Air is equipped with a reflective 16:10 display with a resolution of 1440x900 pixels. Apple does not offer any other displays. In contrast to the typical WXGA resolution of 1366x768 pixels, the user will have some more space vertically and horizontally. Overall, this results in great displaying of the icons, symbols and caption. A larger desktop is available in other models which offer Full HD panels, such as the Asus ZenBook Prime UX31A (matte surface) and fans of touch displays will be happy with the Sony Vaio Pro 13. The maximum display brightness we measured was 264 cd/m² (in the bottom corners) and 295 cd/m² (in the upper central region). 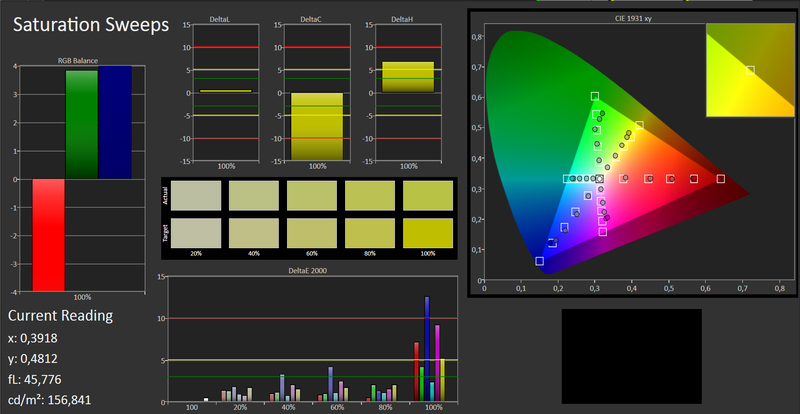 On average, the user has 277 cd/m² available and the illumination lies at 89%. The brightness can be finely regulated as it offers 15 balanced levels. At the lowest level, the display is off and the next level lights it up at 17 cd/m². At level 8, we found the everyday norm of 147 cd/m², which we also used for WLAN and video tests. Even indoors, the user will require higher brightness. This is due to the reflections on the glossy panel that are distracting and can make it hard to make out the content. Bright ambient light brings out this effect (especially while the laptop is at low brightness levels). In our test environment, we found the top three brightness levels to be comfortable to use. Outdoors the effect is stronger. Although the display is quite bright at 277 cd/m², the surroundings are clear in the reflections on the display. The brightness would have to be increased a lot to compensate for this effect. Bright clothes or direct sunlight should be avoided. The contrast measures 655:1 (very good). Pictures, films and games are displayed with satisfying colors and the black is satisfying. 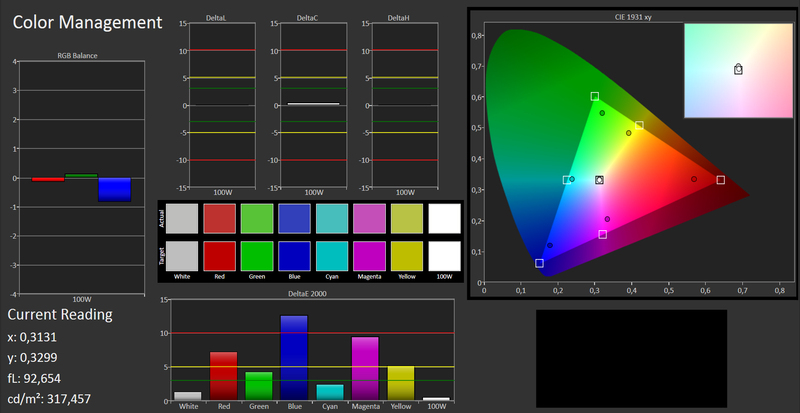 The supported color spectrum covers 55% of the sRGB color space. In addition, the colors (with factory settings) are distorted. 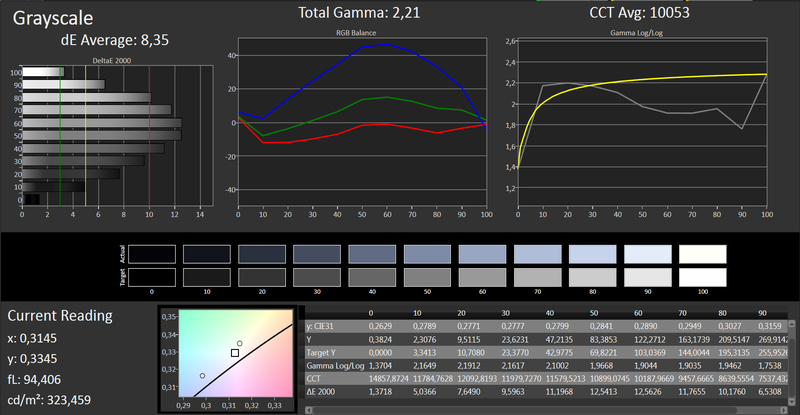 After calibration, the color saturation and gray levels are quite good, showing us that the display has hidden potential. The viewing angle stability is at a good TN level and offers wide viewing angles. However, it cannot compete with IPS panels. 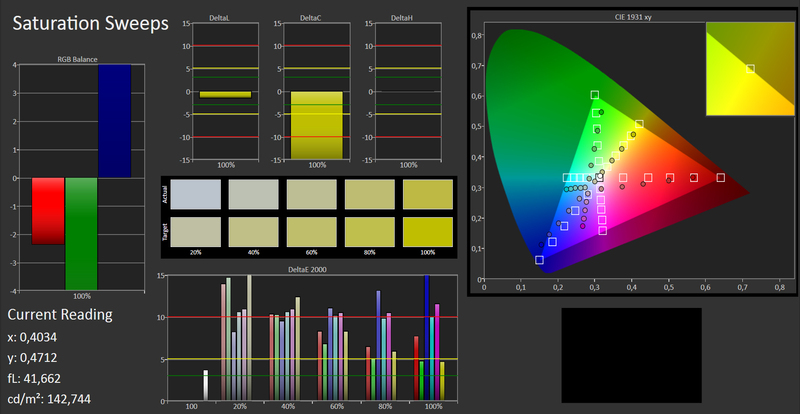 At high vertical viewing angles, the colors invert or fade. The colors are tinted blue or yellow (viewing angle from above/above and to the side). The viewing angle photos show this effect very strongly, whereas in reality, the effect is milder. 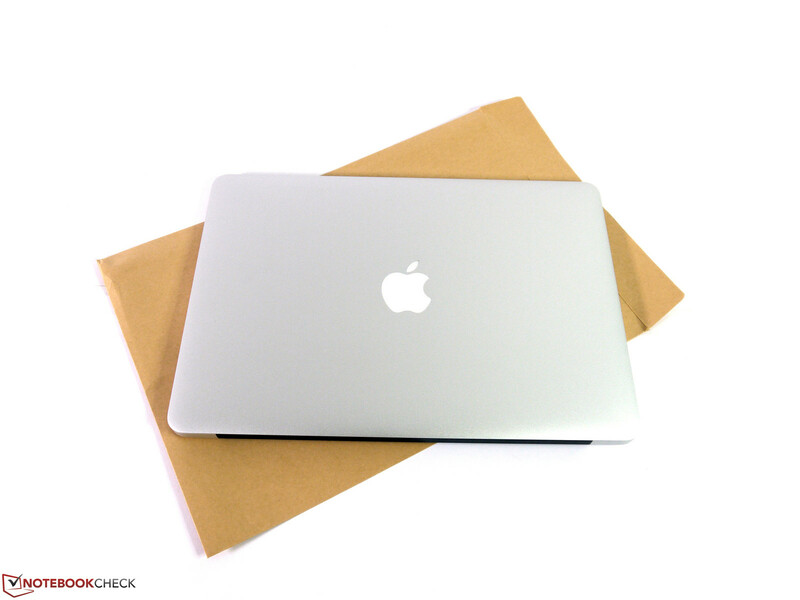 Apple has equipped the MacBook Air 13 with the Intel Haswell generation, which brings the CPU and GPU to the latest technological standards. It is clear from the Apple homepage, that this move was not to increase performance, but to achieve higher efficiency. 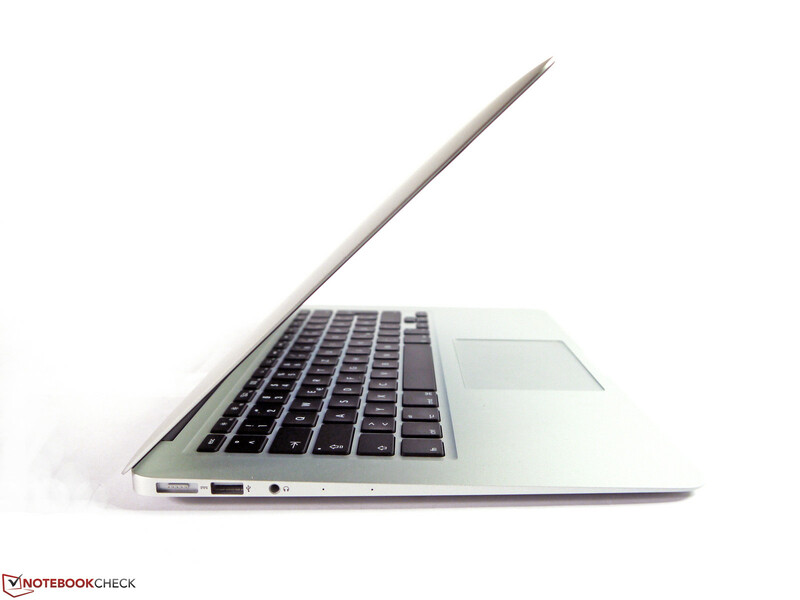 Longer battery life is the result, which means the MacBook Air can now last an entire workday. An increase in performance is brought by the storage device, which is now connected via PCIe and can thus provide faster transfer rates. 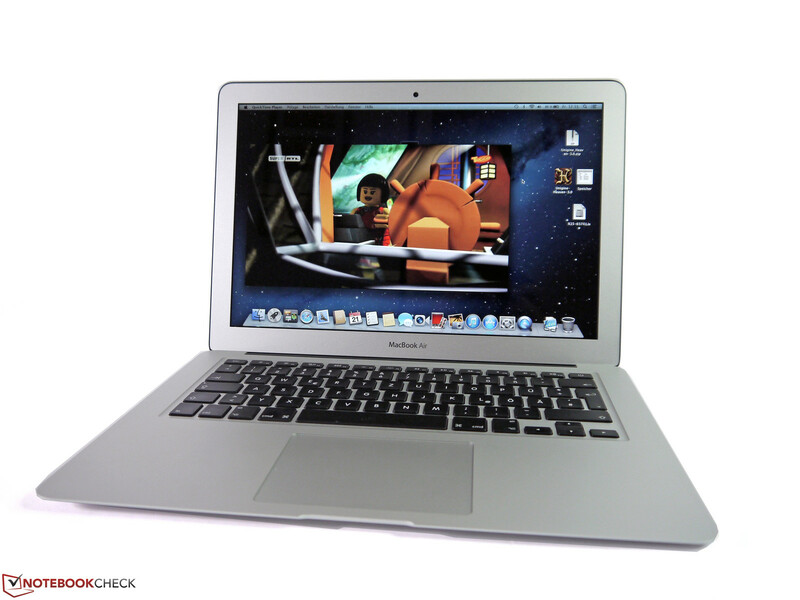 At first glance, the basic MacBook Air does not offer any increase in performance. 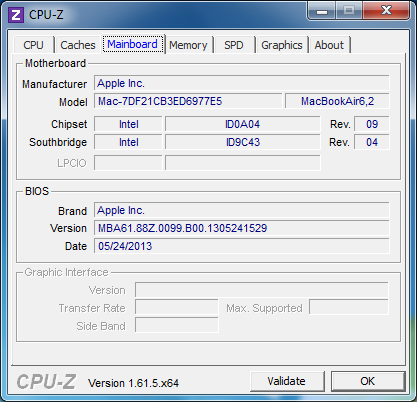 The 2012 model used an Intel Core i5-3427U CPU, which ran at a base speed of 1.8 GHz. 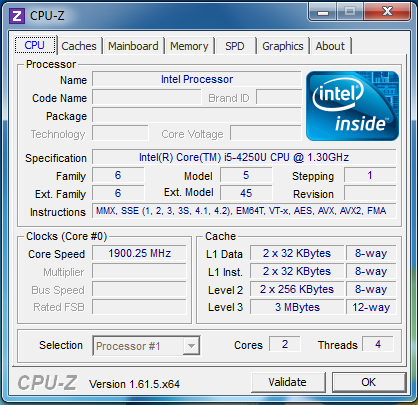 The new Haswell CPU, the Intel Core i5-4250U, runs at 1.3 GHz and can only offer 2.6 GHz (instead of 2.8 GHz) in Turbo mode. The Thermal Design Power has dropped from 17 W to 15 W. This includes the heat loss of the CPU, which in the predecessor amounted to an additional four W.
Despite the extensive power saving features, the benchmark results are still good and lie at the level of the 2012 MacBook Air 13 with Intel Core i5-3427U CPU. The Cinebench R10 32-bit score is 5% less, but the 64-bit version is 5% higher. These differences are minor and will not be noticeable in everyday performance. 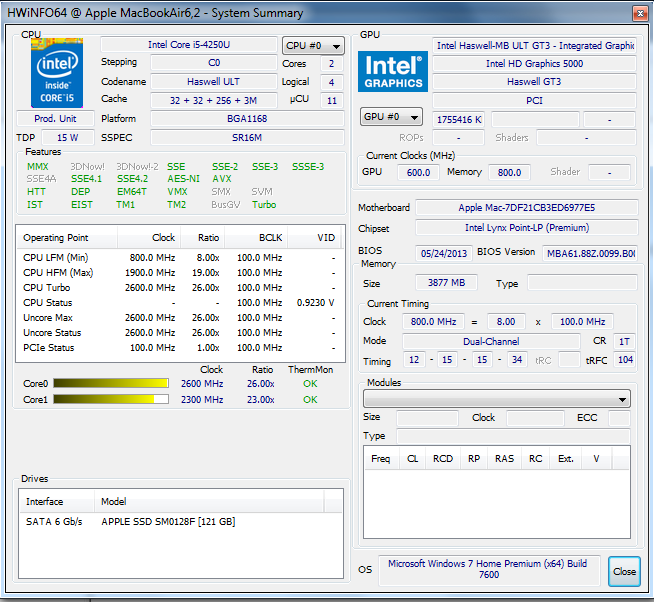 According to Intel, the maximum clock speed is 2.6 GHz, but this is hard to reach even while running single-core tasks. Our tools only recorded this speed momentarily during the SuperPi processing. Most tasks will run at 2.3 GHz. As usual, the results in Mac OS X Mountain Lion are slightly better (depending on the benchmark) than in Windows 7. In Cinebench R10 32-bit, the laptops scores 4,234 and 8,552 points whereas in Windows, the same benchmark ends with 3,692 and 7,659 points. We measured an increased performance while converting MP3 to AAC in iTunes. In Windows, we could only achieve 38.6x speed but in Mac OS X, the laptop could reach 61.3x speed. A list of the benchmarks we ran can be found in the table below. During the stress test, which we ran on Windows 7, FurMark and Prime95 dropped the CPU clock speed to 800-900 MHz within seconds. The power consumption drops from 42 W to 32.7 W and fluctuates around 37.1 W. In the benchmarks, which we ran afterwards, this did not adversely affect performance. On battery, we could not measure any drop in performance. The benchmark results from PC Mark Vantage and PC Mark 7 are nigh identical (in comparison to the predecessor). The RAM operates in dual-channel mode, the storage device is fast enough and the CPU and GPU offer sufficient performance for everyday tasks. We could not find any major weaknesses. Geekbench runs in Mac OS as well as Windows. 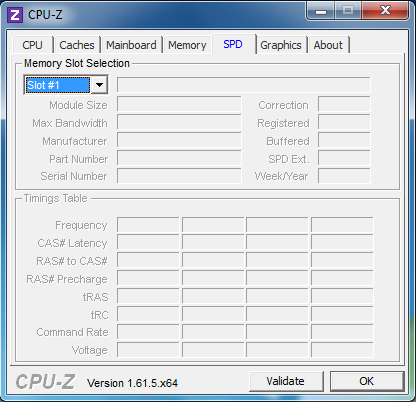 In this benchmark, various CPU and memory tests were performed. In Windows, we reached an overall score of 5,669 points and in Mac OS X, we have 6,015 points. The predecessor scores slightly higher (6,209 points) in Mac OS X. More performance should be provided by a stronger CPU or more RAM. The MacBook Air is not suited for pure CPU calculations or intensive 3D tasks. Apple promises an up to 45% faster storage in the new MacBook Air. 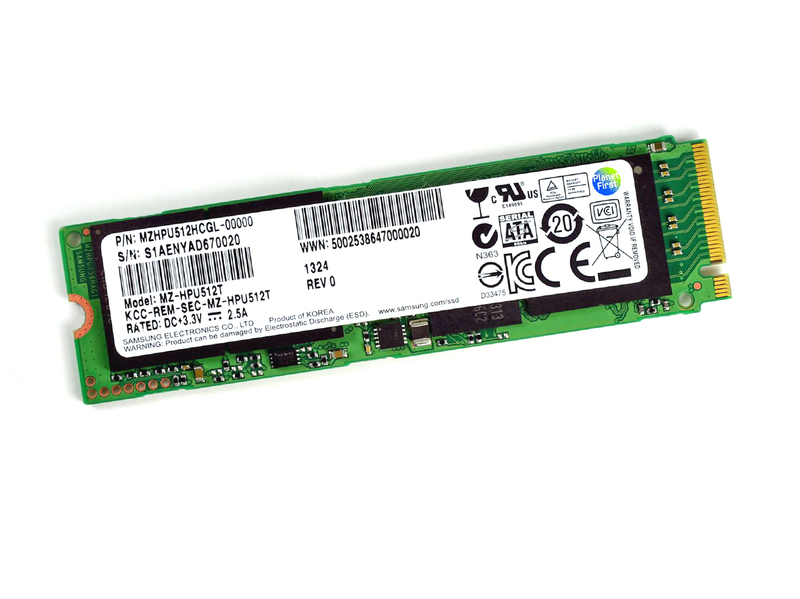 In the 2012 model, a Toshiba SSD was used, but in our test model we find a Samsung SSD, which is no longer connected via mSATA (6G, 600 MByte/s), but rather utilizes the PCIe interface for speeds up to 1,440 MB/s (according to Samsung). 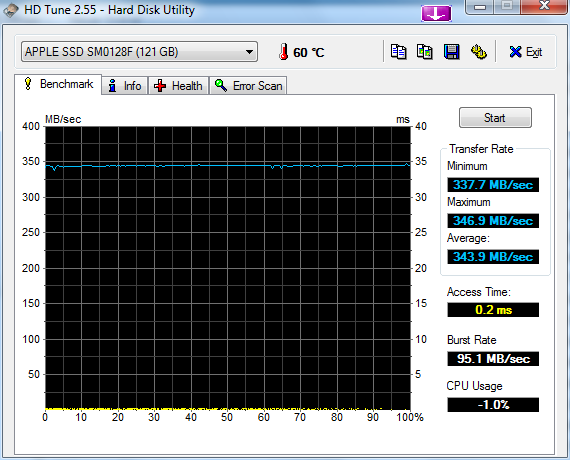 This is possibly the SATA Express SSD XP941. Our test model did not bear an identifying inscription. The M.2 Solid State Drive cannot achieve the theoretical transfer speeds, but it can offer around 700 MB/s (sequential read), which is far above the performance of a SATA 6G SSD. In comparison to the previous Toshiba drive, we recorded an impressive increase of 11 - 47% in two areas. However, this performance drops slightly while reading small files (4k) or simultaneously writing small files (4k-64). In everyday use, the user will barely notice an increase in speed if s/he previously used an SSD. However, the short access times and high transfer speeds leave traditional HDDs in the dust. The user will not have a lot of storage space in the basic configuration: 128 GB. However, Apple offers build-to-order options with 256 or 512 GB drives. It is worth noting that the increase in price is by no means minor. Although the Intel Core i5-4250U CPU of our test model is actually an Ultra Low Voltage processor, it has the Intel HD 5000 (GT3) IGP integrated. This chip ranks high in Intel’s IGP graphics ranking and offers more performance than its siblings of the GT1 and GT2 level. 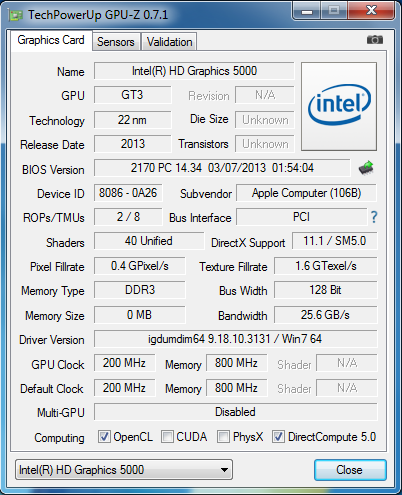 The Intel HD 5000 IGP operates at a base clock speed of 200 MHz, which can increase up to 850 MHz depending on the task. Of course, the speed also depends on the load on the CPU. The CPU and IGP share the 15 W TDP, which is the limiting factor. The IGP scores well in the graphic benchmarks. In OpenGL Shading with Cinebench R10 (32-bit) we measure a score double that of the predecessor (Windows 7: 6,446 points, Mac OS X: 6,171 points). The Heaven 2.1 result is also higher than the predecessor: 13.1 fps to an average of 10 fps. The IGP continues its great streak in the 3D Marks `06, Vantage and 11 benchmarks (all in Windows). In 3D Mark Vantage, the score was 70% higher: 1,131 to 661 points. The Cinebench R11.5 result proved to be the exception to the rule: in Windows, our IGP could barely reach the performance of the Intel HD Graphics 4000 (17.35 vs. 17.09 fps). Mac OS X performs better with the benchmark: 22.07 fps. 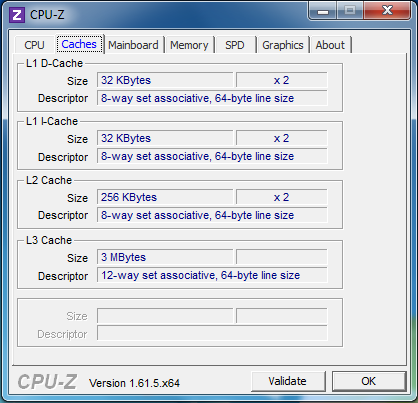 As shown before by the CPU, the IGP has slightly fluctuating clock speeds at full load (GPU-Z). At the start, the IGP runs at 850 MHz but then falls down to 600 - 650 MHz. However, this did not seem to affect the performance in benchmarks we ran afterwards. Overall, the graphics section has enjoyed a significant performance increase. However, our IGP cannot compete with a dedicated middle-class GPU. Intel’s Quick Sync Video is a handy feature in Windows. This Hardware-Decoder/Encoder accelerates video conversions by sharing the load between the IGP and the CPU instead of utilizing pure CPU processing. The table in the Processor section reveals how big this effect is. A welcome side effect is the lower CPU load, which allows the user to use the system for other tasks simultaneously. The gaming performance of the Intel Core i5-4250U with integrated Intel HD Graphics 5000 often suffices for medium settings and native resolution. New games like Tomb Raider or Bioshock Infinite require lower settings to run fluidly. In Mac OS, we tested World of Warcraft, Diablo III and Starcraft II. As we lacked benchmark tools that would run with Mac OS, we can only provide a subjective rating of the performance. Overall, all three games ran fluidly at medium settings. 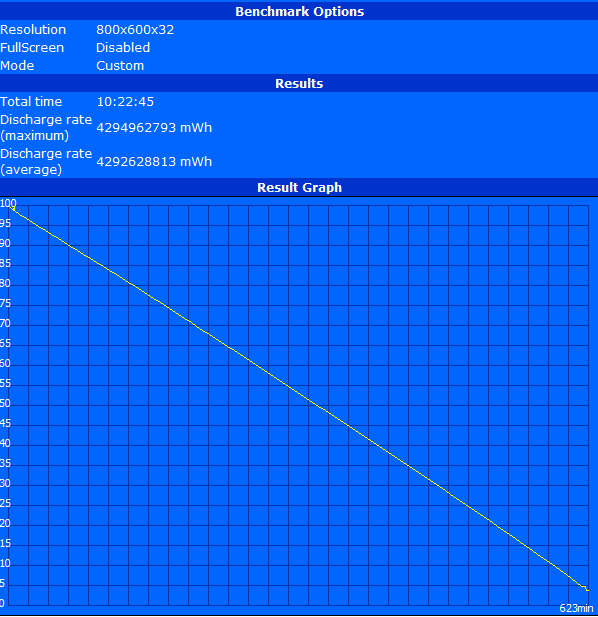 Similarly, in Windows 7, there is still some breathing room to raise the resolution to the native 1440x900 pixels. 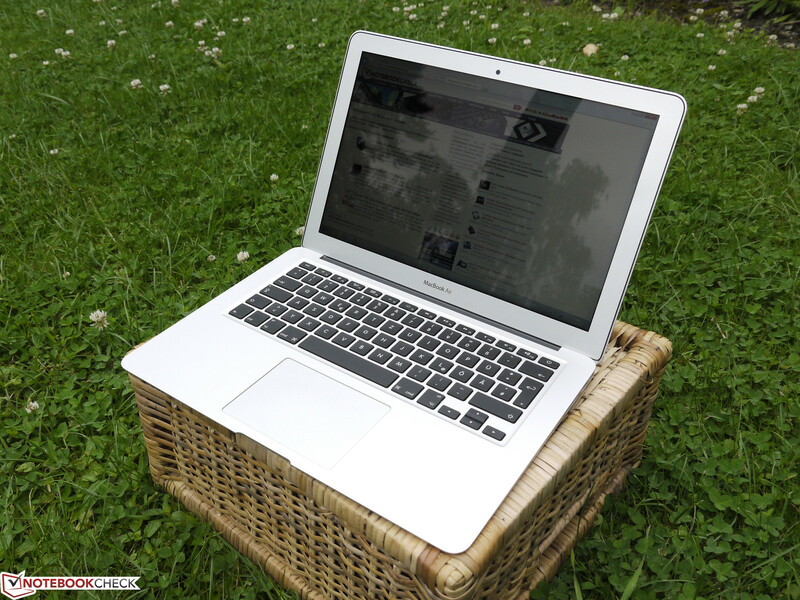 The MacBook Air is a quiet notebook, whether in Mac OS or in Windows. In many scenarios, it is silent. While playing the Full HD video "Big Buck Bunny" or converting videos with iTunes to an iPad compatible format, there is no fan activity. The fan becomes audible when more demanding tasks are run. These include playing games and big file conversions. In this scenario, the fan turns up slowly and steadily to 36.6 dB(A). The maximum noise emission measures 45.1 dB(A) and is only possible to reach with high load for longer periods of time. 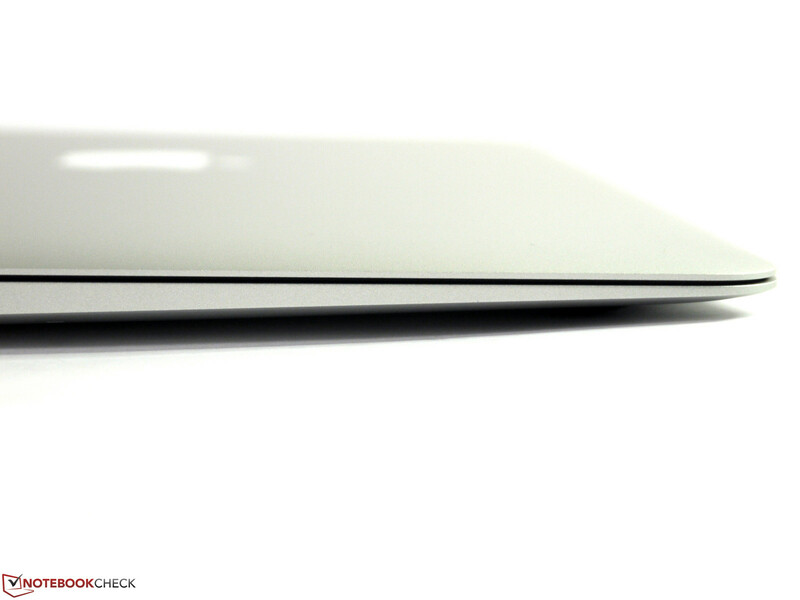 After being turned on, the cool surface temperature of the MacBook quickly rises to a comfortable level. After 2 hours, it can reach up to 42 °C (107.6 °F) above the keyboard. The fan is not noticeable and the emissions find their way out through the aluminum case. 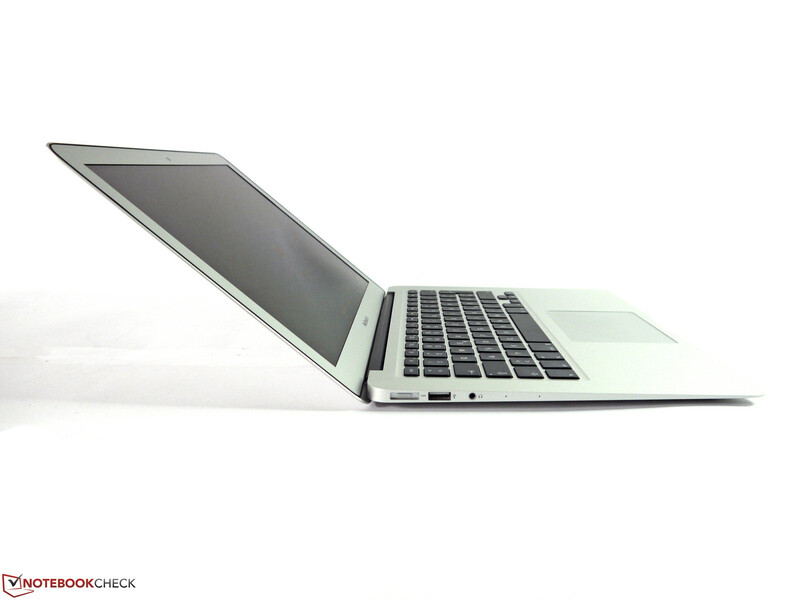 The user can place the MacBook on his lap and the hand-rest regions are comfortably warm. After a full load phase of more than 2 hours, the surface temperatures rise up to 46.6 °C (115.88 °F) above the keyboard and on the bottom. Use on the lap is no longer comfortable, but the hand-rest regions stay at 37.4 °C (99.32 °F) which is comfortable. The small stereo speakers provide good, clear sound, which lacks bass and middles. The volume can be regulated in 16 levels, which is nice, but the maximum volume could have been louder. External speakers can be connected via USB, Bluetooth or the 3.5 mm jack. A separate microphone jack is not available as it is integrated into the combi audio jack. The power consumption heavily relies on the OS used. In general, Mac OS X runs much more efficiently, thus consuming less power. Windows 7 requires a minimum of 5.1 W (brightness level 1, WLAN off) and OS X requires 2.8 W at similar settings. In other tests, the gap between the two grew smaller but the Mac OS could always save one or two Watts more than its Windows counterpart. In full load scenarios, we measured fluctuating values. 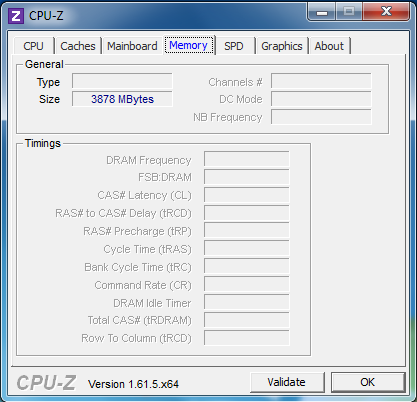 This is due to the fluctuating speeds of the CPU and IGP, which are limited by their maximum TDP. At full load, we have maximum consumption of 36.9 - 40.7 W and up to 42 W.
The power adapter offers 45 W and thus does not have much breathing room given the maximum consumption of 42 W. However, we did not notice any power adapter throttling. The battery life was measured using Battery Eater in Windows and similar settings in Mac OS X. In addition, we ran a few more tests so as to paint a more accurate picture for the reader. 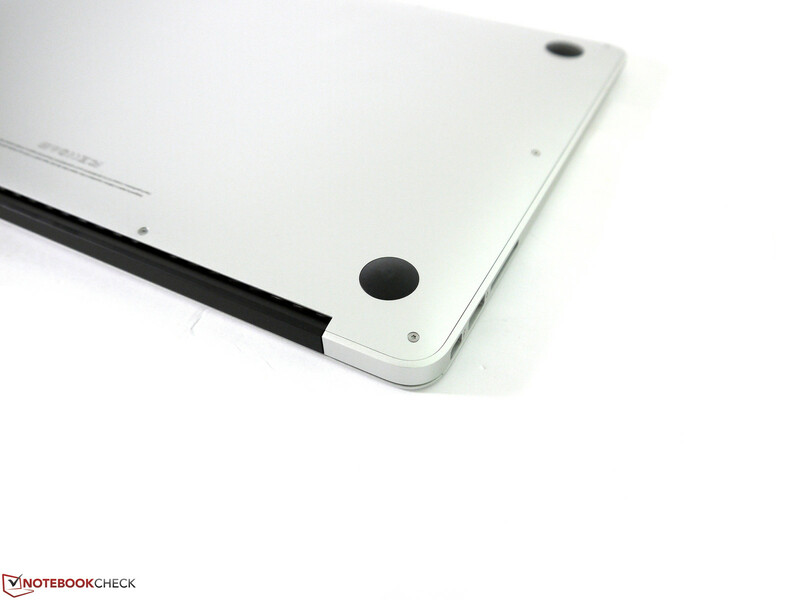 The Lithium-Polymer battery of the MacBook Air has a capacity of 50 Wh and cannot be removed from the case. 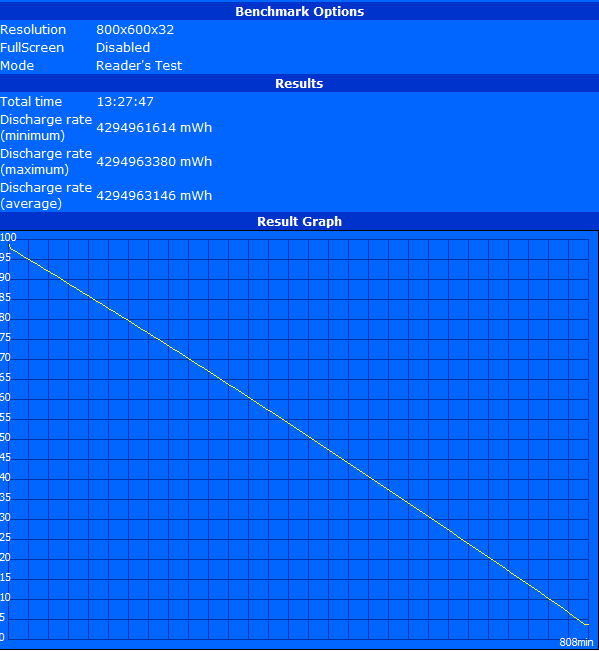 In the Battery Eater Reader’s test (minimum brightness, wireless off), we reached a run time of 13:28 hours. 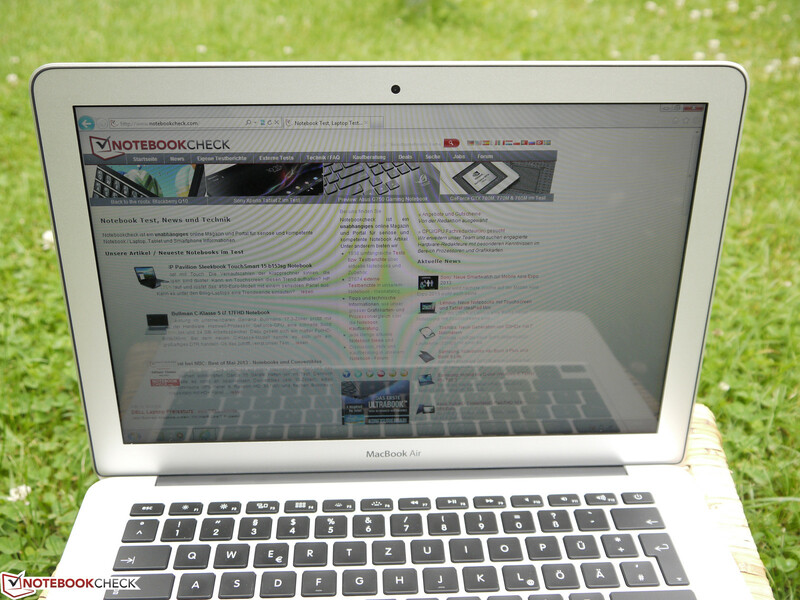 In Mac OS X, with similar settings, the notebook ran 19 hours. However, the display is barely legible at 17 cd/m². The practical WLAN test (brightness of 147 cd/m², wireless on, power-saver mode, script running an infinite loop) Windows 7 ran for 10:23 hours and Mac OS X ran for 11:28 hours. To measure the video playback run time, we ran Big Buck Bunny in every test for 2 hours in an infinite loop and then calculated the rest capacity of the battery. In both Windows and OS X, we used iTunes 11, as with other programs, file formats and settings it is possible to either achieve a longer or shorter battery life. In addition, the battery can deplete at different rates depending on the charge remaining. As such, the reader should consider the values noted in the table as an indication of the possible battery life. Depending on the settings and OS, we measured a run time of 6 - 8 hours. The full load scenario of the Battery Eater Classic (maximum brightness, high performance mode, all modules on) could only be run on Windows 7 as we could not find a similar test for Mac OS X. After 1:42 hours, the battery was empty. In everyday use, this may be applicable when playing games or converting large files. 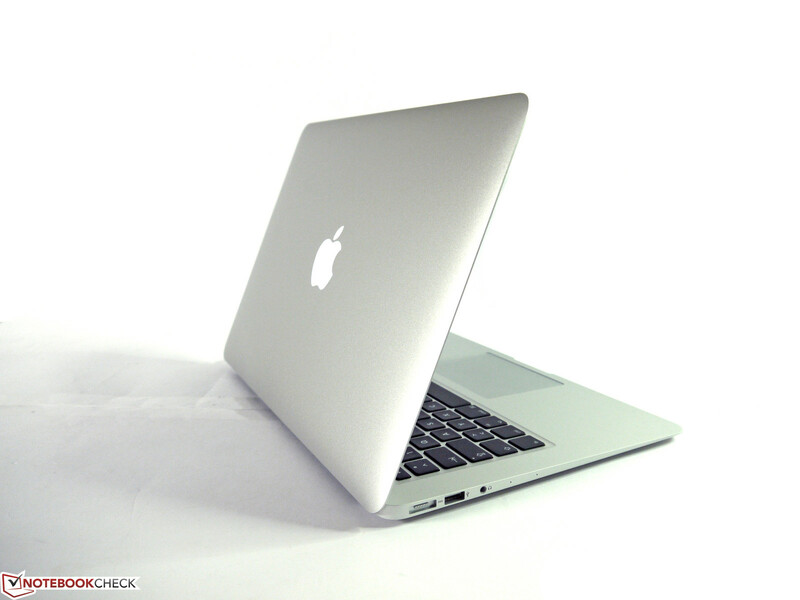 The MacBook Air 13 excites users with its slim and attractive unibody case. The workmanship is almost flawless and the noise emissions are barely noticeable (for the majority of the time). The new model supports the WLAN-Standard 802.11ac, has a faster Solid State Drive and can offer a much longer battery life thanks to the new Intel Haswell ULV CPU. The CPU processing power has stayed at a similar level but the GPU power has increased. The user is limited by the reflective display, the lack of maintenance flaps and the somewhat high temperatures at load. A 4G/LTE version, which would be very helpful for mobile use, is not available, just like there is no option for a matte display. The warranty period is short for this price range (1 year) and the necessary adapters for Thunderbolt/Mini-DisplayPort interfaces are not included in the delivery. However, the price has been lowered by 100 Euros (~$131/in comparison to the predecessor) which means the new Apple MacBook Air is in better shape to face off against its many competitors from Asus, Samsung & Co. 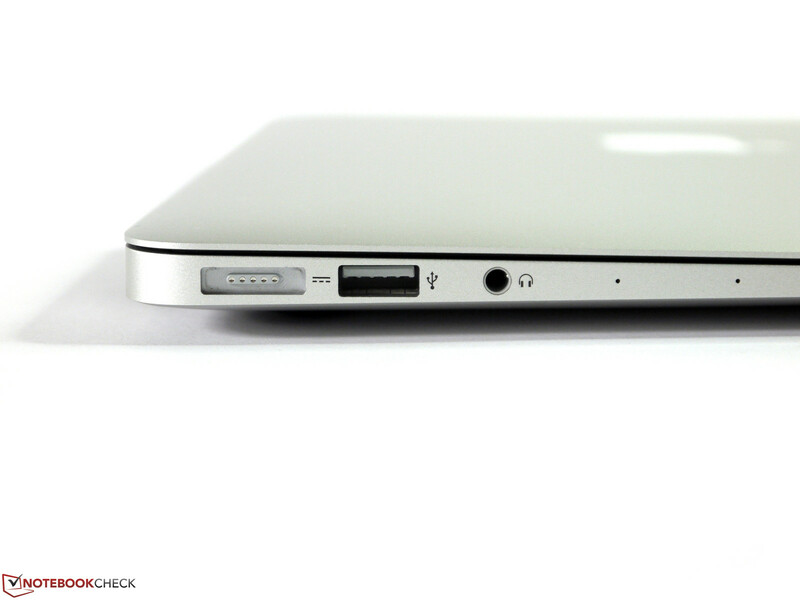 The MacBook Air - eye candy since 2008. 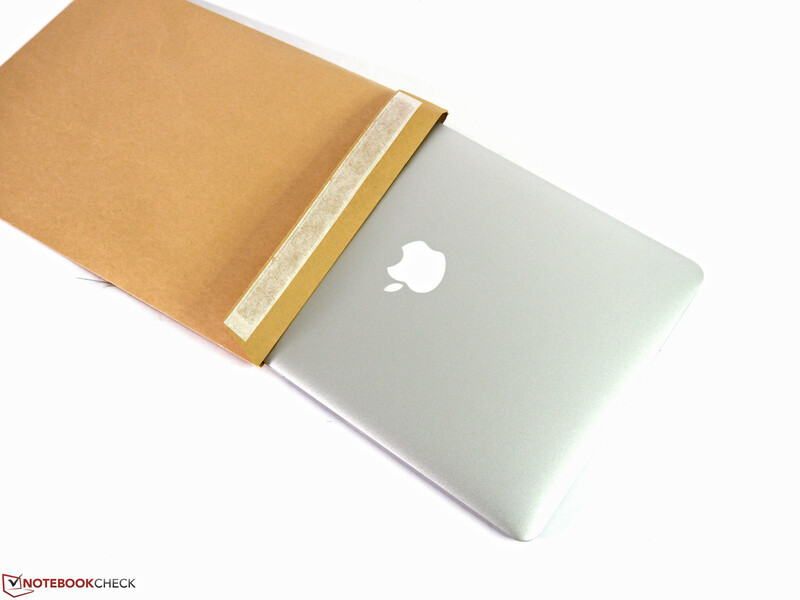 The B4 envelope is often associated with this slim Apple notebook. The case properties and surface impression are very good. The display is blessed with many good properties. ... and the surface reflects strongly. 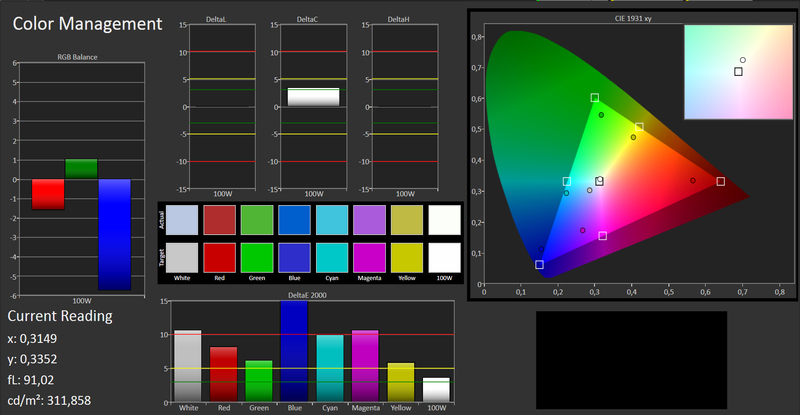 A resolution of 1,400 x 900 pixels offers a good compromise between the display surface and caption size. Fingerprints and dust are hard to find on the aluminium surface. Very attractive - the slim silhouette. The opening angle of the display is very limited and the hinges can not hold the display firmly in position (when the angle is very wide). Even at high brightness, the surroundings are reflected clearly on the panel. At low load, low noise emissions. Even while playing a Full HD video, the fan does not turn on. 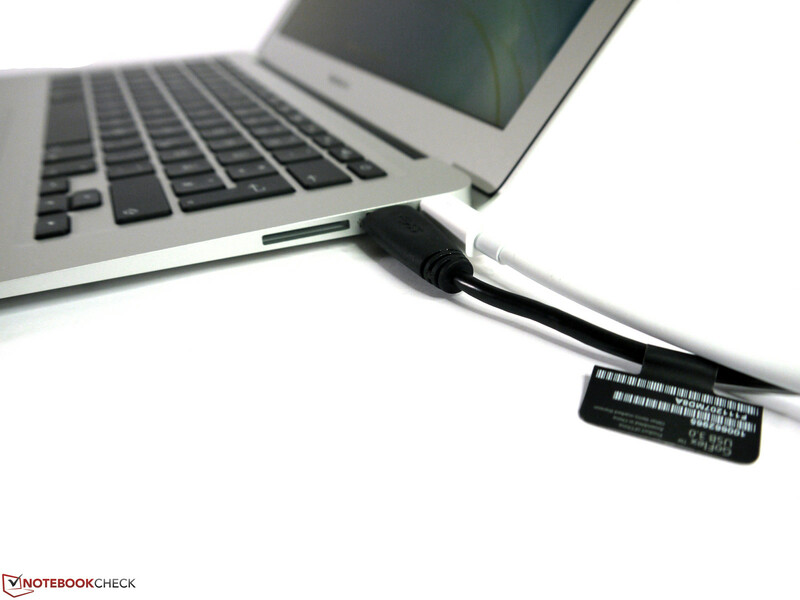 Wide USB sticks can block the neighboring ports. Seamless integration of all parts. Memory cards can not be fully pushed into the notebook. 720p resolution is offered by the Facetime camera. 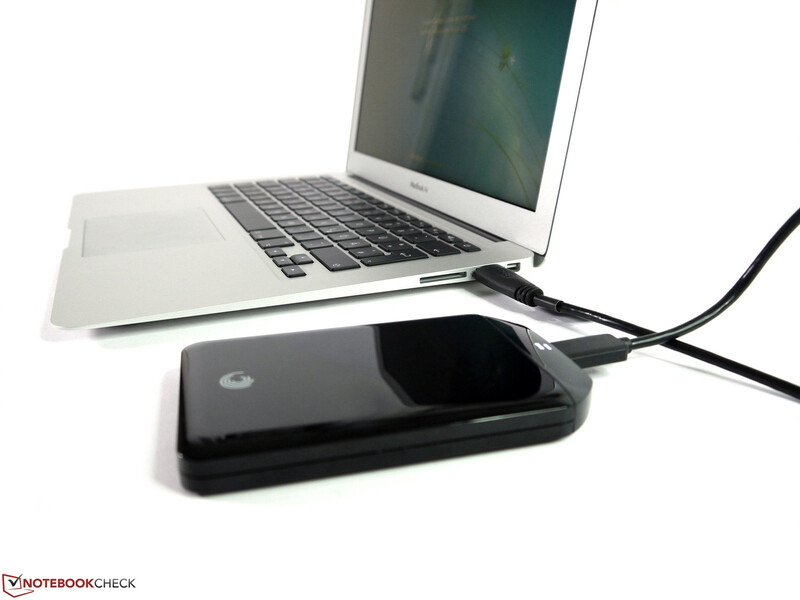 Thunderbolt offered up to 270 MB/s with an external SSD. Seagates GoFlex hard disk was limited to 90 MB/s. A DisplayPort adapter is not included in delivery. Accessories from third-party manufacturers are often cheaper than the ones offered by Apple. Normal USB cables can be used without problems simultaneously with other cables. 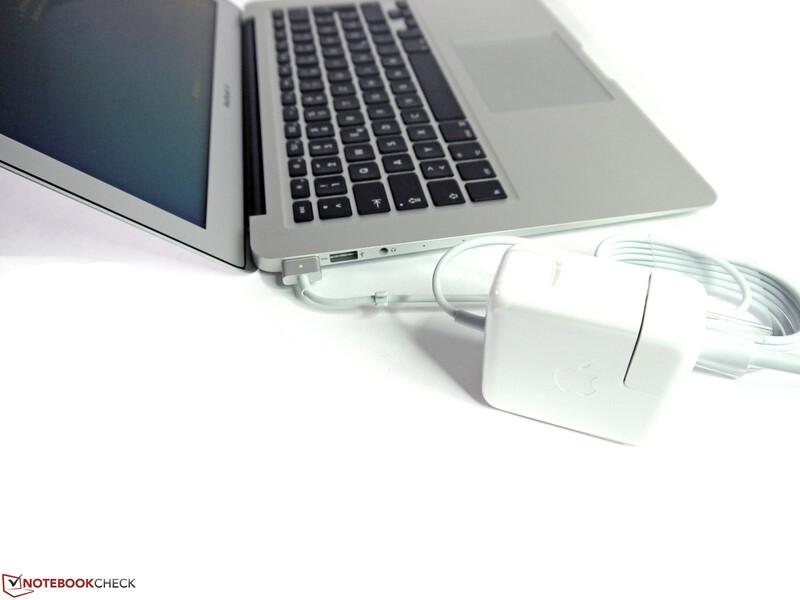 The power adapter offers 45 W.
USB 3.0 has a max transfer rate (in test) of 145 MB/s. A pentalobe screw can open up the flap on the bottom. This hides the system components and the battery. 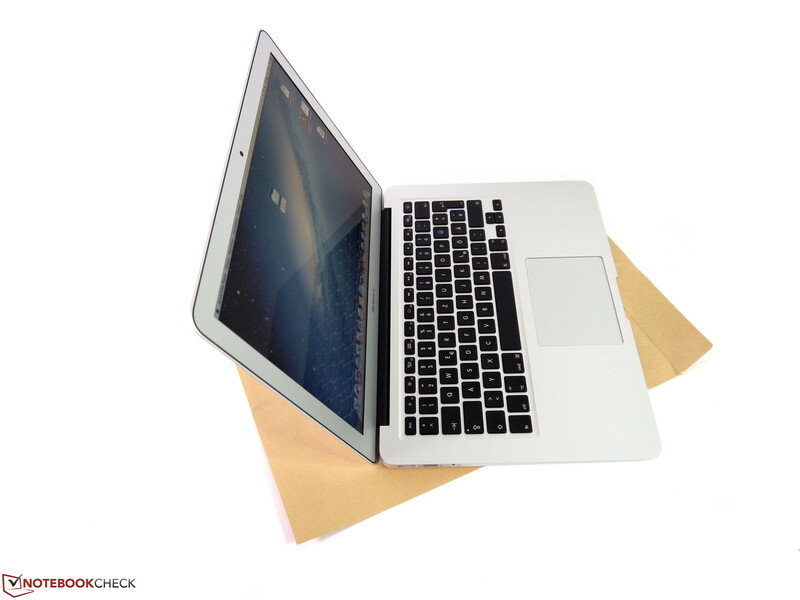 Although the design is already 5 years old (or older), it still excites customers with its slim unibody case. The long battery life and good keyboard ensure comfortable use. A matte display, an integrated mobile broadband module (4G/LTE) and hinges which support the display better (at wide angles). The competition required so much time to create laptops which could compete with the MacBook Air. 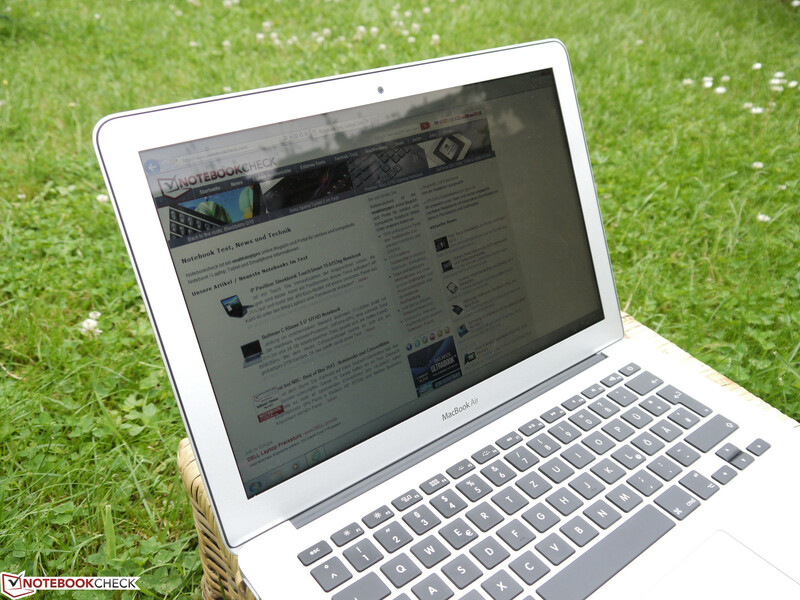 Only now can we say that the alternatives are very attractive and offer some advantages over Apple's notebook. Asus Zenbook Prime UX31A with matte display or touch display, Dell XPS 13, Samsung Series 9 900X3C, Sony Vaio Pro 13, MacBook Pro 13 Retina.